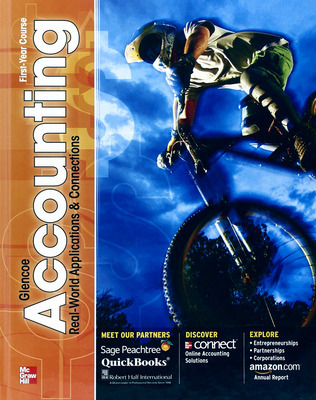 Glencoe Accounting: Real World Applications and Connections is thoroughly integrated with Peachtree Accounting and Quickbooks to give students a real-world learning experience. Real businesses like Amazon.com make learning relevant; academic skills are integrated throughout to meet Perkins mandates. Glencoe Accounting is available on McGraw-Hill Connect™ for online teaching and learning ease! Glencoe Accounting: Real-World Applications and Connections is the market leader in high school accounting! With the program now available in Connect™, the program can be taught online and teachers can manage their classes and resources online. McGraw-Hill’s Connect™ platform allows teachers to select and assign pre-built assignments, including 256 chapter Working Papers problems and banks of test questions for all 29 chapters. Teachers can categorize assignments as either homework, practice, quiz, or exam and they can apply policy settings like due dates, time limits, and number of attempts allowed. Teachers can also edit the pre-made assignments to meet their unique needs or they can create assignments using their own resources or using other program resources like end-of-section and end-of-chapter activities in the eBook and print unit Working Papers projects. Most pre-built assignments are graded automatically and student progress can be tracked using the Connect™ reporting system. The program includes real-world connections and applications, academic integration, and reading strategies designed to meet Perkins mandates.